Thomas Karman’s newly released “Thoughts on Parade; Observations from the Sidewalk” is an assortment of thoughts and poems which reminds readers that God is everywhere. “Thoughts on Parade; Observations from the Sidewalk” from Christian Faith Publishing author Thomas Karman is a collection of works concerning life and the many gifts of God in it. 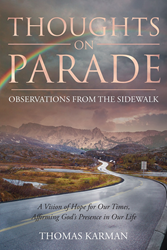 “Thoughts on Parade; Observations from the Sidewalk”: gives a glimpse into the thoughts of God and life that give the author a unique perspective. “Thoughts on Parade; Observations from the Sidewalk” is the creation of published author, Thomas Karman, a German immigrant who came to the United States with his family in 1951, Karman has worked in a variety of fields including Information Technology, the US Army Reserve, the American Red Cross and more. Published by Christian Faith Publishing, Thomas Karman’s new book contains a series of poems with thoughts about God and life that show the connectivity of the two. Inside the readers can begin to understand the story of a German immigrant who came to the United States to start a new life. This wisdom gained by decades of life in places across the US and Europe result in poems that give the reader a feel for the times the author lived through. Karman hopes that the works in this book will inspire and encourage readers to begin a discussion of their vision of our future. He also outlines his process of writing a poem. View a synopsis of “Thoughts on Parade; Observations from the Sidewalk” on YouTube. Consumers can purchase“Thoughts on Parade; Observations from the Sidewalk” at traditional brick & mortar bookstores, or online at Amazon.com, Apple iTunes store, Kobo or Barnes and Noble. For additional information or inquiries about “Thoughts on Parade; Observations from the Sidewalk”, contact the Christian Faith Publishing media department at 866-554-0919.